Pictured above (from left): Lorrie Belcher, Gloria Keating, Donna Belcher, Bruce Belcher, Meghan Scott, Todd Mihalchik, Sonja Raye, Mitch Campbell. 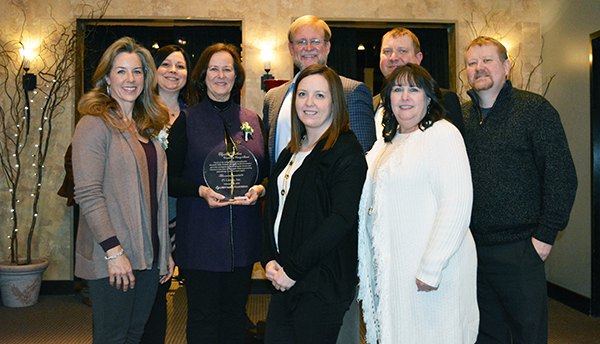 On February 28 at Maceli’s in Lawrence, Kan., the Lawrence Memorial Hospital (LMH) Health Foundation bestowed one of their highest awards upon P1 Group. The 16th annual P1 Group Charity Golf Tournament on October 13 raisedThe 16th annual P1 Group Charity Golf Tournament on October 13 raised $14,262 for Warriors’ Ascent, a Kansas City-based organization thatserves veterans and first responders to help them cope with moralinjuries they’ve suffered in the line of duty. Warriors’ Ascent was founded in 2014 by two Iraq combat veterans,and has since served more than 300 veterans and first responders struggling with post traumatic stress through a five-day program runeight to 10 times per year. Twice annually, P1 Group associates are invited to apply for the Corporate Sponsorship award. The sponsorships allow P1 to serve the community through organizations that are meaningful to P1 associates. P1 recently donated the material for lab/construction countertops to the Kansas State Society of Automotive Engineers Formula Race team (K-State Formula SAE). The donation played a role in helping the team build their newest race car, “Ocelot” (pictured, above). Formula SAE is the world’s largest and most prestigious design competition with 13 international competitions and over 500 active teams. Powercat Motorsports has represented K-State in competition every year since 1997. P1 Group is committed to nurturing the professional talent of tomorrow. Helping promising students fill the pipeline of professionals that will one day work in our industry is an integral part of our sustainability. That’s why P1 created the Construction Science Scholarship, awarded each year to a promising student in the Kansas State University Construction Science program. The Native Sons Motorcycle Club and a regionally-ranked Taekwondo competitor are the recipients of the Spring 2018 P1 Group Corporate Sponsorships. Twice each year, in the spring and fall, P1 associates are invited to apply for a Corporate Sponsorship award. The sponsorships allow P1 to serve our communities through the organizations that are meaningful to P1 associates. LENEXA, Kan. - Ron Schwatken, the father of P1 associate Sonja Raye, won P1 Group’s March Madness Bracket Challenge. Each year, P1 Group associates, family and friends are invited to fill out NCCA Tournament brackets for ten dollars per bracket. The winner receives half of the proceeds while the other half is matched by P1 and donated to the charity the winner chooses. Paul Smith, P1 Group, presented the tournament proceeds to Cynthia Randazzo, CEO (left) and Rose Simone, Director of Development., The Research Foundation. LENEXA, KS – The 15th annual P1 Group Charity Golf Tournament raised $12,260 for The Young Traffic Offenders Program (YTOP) of The Research Foundation. Paul Smith of P1 Group presented the check recently to Foundation staff. LENEXA, Kan. - An outdoor learning area at an elementary school and a competitive softball team are the recipients of the Fall 2017 Corporate Sponsorships. 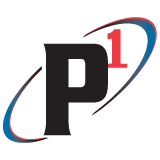 The P1 Corporate Sponsorship program provides financial contributions to selected organizations nominated by P1 associates. The sponsorships provide a way for P1 to serve the community through the activities, events and organizations that are meaningful to P1 associates. LENEXA, Kan. – More than 50 kiddos descended on P1 Group on April 27, 2017 to see where their parents work and learn a little bit about the construction industry! The day started out with a stop by the P1 Photo booth to capture a commemorative shot, then the festivities kicked off with a craft based on this year’s theme, “You Can Count on Me”. The KC Elite Fastpitch team. Two non-profit organizations nominated by P1 Group associates have been awarded the Spring 2017 Corporate Sponsorships. LENEXA, Kan. - Mike Totta, the husband of P1 associate Cheri Totta, is the winner of the 2017 Charity Bracket Challenge. He will split the proceeds with his charity of choice. Each year prior to March Madness, P1 Group associates, family and friends are invited to fill out an NCCA Tournament bracket for ten dollars. The winner receives half of the proceeds while the other half is matched by P1 and donated to the charity the winner chooses. LENEXA, Kan. – This year P1 Group proudly participated in Operation Gratitude’s Halloween Candy Give-Back Program, which encourages local communities to gather and donate leftover candy to send to deployed troops and first responders. Thanks to efforts of employees and two local schools, Wolf Creek Elementary and Leawood Elementary, P1 was able to send 23 boxes (and a whopping 500 pounds) of candy to the cause! Kennedy Sanders, P1 start and test manager, fire life safety testing and maintenance for Las Vegas Sheet Metal Local 88. LAS VEGAS, Nev. - An article in the NEMIC News (National Energy Management and Institute Committee) recognized P1 Group and Las Vegas Sheet Metal Local 88 for their efforts to educate building owners about fire life safety. LENEXA, KS – The 13th annual P1 Group Charity Golf Tournament raised $11,594 for The Children’s SPOT (Speech Physical and Occupational Therapy) of Saint Luke’s Health System. Dennis Chenowith, the retired Saint Luke’s Health System Director of Facilities and Construction, thanked the golfers when they gathered after the tournament, informing them that The Children’s SPOT offers early and intensive therapy to children with disabilities and developmental delays, helping them function successfully in life. He said Kansas City contractors, including P1 Group, and labor unions have donated millions to The Children’s SPOT over the years, enabling SPOT to offer services to families regardless of their ability to pay. LENEXA, Kan. – Two non-profits nominated by P1 Group associates have been awarded the Fall 2016 P1 Corporate Sponsorships. P1 Group Bluebeam users (from left) Laura Adkins, Nathan Pendergraft, Vanessa Taylor and Sarah Garcia, hosted the KC Bluebeam Users Group. KANSAS CITY, Kan. – P1 Group was an exhibitor at the Garden City Ammonia Program 2016 Region 7 Ammonia Safety Day, held at Kansas City Kansas Community College on June 2. Industrial ammonia refrigeration is typically used by food processors and other manufacturers whose products must have cold storage in large spaces. Although highly useful and necessary, ammonia does present special safety concerns and requires highly trained technicians. The Garden City Ammonia Program, located in Garden City, Kan., provides training and certification events throughout the country. LENEXA, Kan. – Three non-profit organizations nominated by P1 Group associates have been awarded the Spring 2016 P1 Corporate Sponsorships. LENEXA, Kan. – Trey Jones, a former P1 Group field associate who now works for BNSF Railway, is the winner of the 2016 P1 Charity Bracket Challenge. He will split the proceeds with the charity of his choice, St. Jude Children’s Research Hospital.